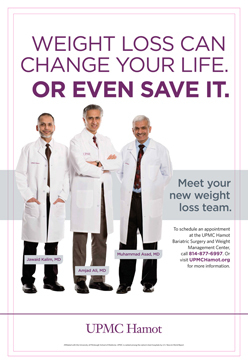 Welcome to UPMC Hamot Bariatric Surgery and Weight Management Center. The center has been serving the community since 2003 when the bariatric surgery program was started at UPMC Hamot Medical Center. Over the years, the program has expanded and now offers comprehensive weight management services that include non surgical options in addition to bariatric surgery. Ours is the oldest and most comprehensive weight management program in the region and our team of very experienced health care professionals continues to provide state of the art care to patients suffering from the disease of obesity. and make an appointment to attend one of our information seminars. If you have already been registered with EMMI Solutions through UPMC Hamot Bariatric Surgery Center, you can click on the link to complete your preoperative education. You will need an access code from our office to visit this website. Please call our office at 814-877-6997 for your access code. What Steven is Saying More..
Who is eligible for weight loss surgery ? Will this surgery mean I can eat anything and not exercise ? How much weight can one expect to lose ? Please use email only for non urgent communication with the office and call the office at 814-877-6997 with any urgent message. UPMC Hamot Bariatric Surgery And Weight Management Center holds a Preop Support Group Meeting for weight loss surgery every month on the 3rd Wednesday at 6 pm. There is no fee to attend support group meetings and they are open to anyone interested in support for weight loss surgery. Support Group Meetings are held at Magee-Womens, UPMC Hamot in the Lincoln Center, 118 E. 2nd Street, Erie, PA.
We also hold a monthly support group meeting designed to address the special needs and concerns of postop bariatric patients. The Postop Support Group Meeting is held at 5 pm before the main meeting at the same location. 2nd Monday of every month. UPMC Hamot Bariatric Surgery and Weight Management Center is offering FREE information seminars about weight loss surgery. During the session, you will hear from one of our providers, discover what you need to know to navigate the insurance maze, and learn about what kind of pre-op preparation and testing you will be required to have. To find out more, please call our office at (814) 877-6997 to reserve your spot at our next information session. UPMC Hamot Bariatric Surgery Center is now offering comprehensive weight management services in addition to weight loss surgery. This program is geared to help those who are not heavy enough to be candidates for weight loss surgery but still need to lose weight to improve their health. It is also for those who are candidates for weight loss surgery but do not feel comfortable with the thought of having surgery to lose weight. We are offering a weekly group session to introduce the services offered. There is a $10 fee to attend these sessions. Additional event in 2018....Cooking classes offered...please call the office at 814-877-6997 for information on the next class.